"70cl / 43.0% - The 1996 edition of Distiller's Edition from Glenkinchie, this is made with a secondary maturation in Amontillado sherry casks, which add loads of fascinating flavour?" "70cl / 43.0% - This 12 year old is the new entry level bottling from Glenkinchie, released in 2007 to replace the 10 year old. " 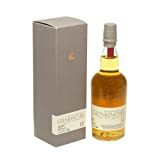 Glenkinchie is one of the Classic malts of Scotland and this 12 year old example is bright gold in colour, light bodied, sweet and creamy with a subtle floral fragrance. Sweet and smooth, this whisky is easier to drink than many. "70cl / 55.1% - The 2010 special release from Lowland distillery Glenkinchie. Fruity, smooth and luxurious. A lady-whisky if ever we saw one."